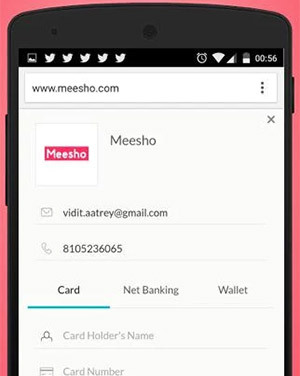 Social commerce platform Meesho has raised an undisclosed amount of angel funding from investor Rajul Garg, besides other investors, two people familiar with the development told Techcircle.in. The two people did not want to be named. They also declined to name the other investors. A business-to-business (B2B) platform, Meesho, previously called Fashnear, allows sellers to set up an online shop through its platform and also facilitates sharing on other social media platforms such as WhatsApp, Facebook, Pinterest, amongst others. The Bangalore-based startup was founded by IIT Delhi alumni Vidit Aatrey and Sanjeev Barnwal in 2015. Aatrey has previously worked with InMobi and ITC, while Barnwal has worked with Sony and Samsung. Garg is co-founder and director of Sunstone Business School and has previously invested in Innotarget Fashalot Retails Pvt Ltd, which runs location-based fashion and store discovery mobile platform Fashalot. He has also backed several health-tech startups, including Corner Store Technologies Pvt. Ltd, a full-service pharmacy targeting patients with chronic illnesses that operates under the brand LifCare and AddoDoc Technologies Pvt. Ltd, which runs the Babygogo mobile app that connects parents with child healthcare experts. In a similar segment, Hyderabad-based Thinkbits Internet Technologies Pvt Ltd, the company behind social commerce startup VioletStreet.com, has raised $315,000 (about Rs 2 crore) in angel funding from former Bank of America senior vice president Venkat Vallabhaneni and angel investor Srinivasa Rao Paturi last year. Another player is Snapdeal-owned Shopo, a zero commission marketplace which allows individuals to become sellers at the click of a button for both new and used goods.